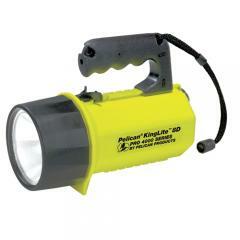 Pelican 4000 King PelicanLite Spotlight FREE SHIPPING! Pelican's powerful King PelicanLite® is made of unbreakable ABS body with polycarbonate lens and thermoplastic rubber shroud. Features include a dual filament Xenon back-up safety lamp, operating during 30 hours each filament (60 hours in total). It includes a patented shock absorbing internal battery module that protects 8-D cells alkaline batteries (not included) from hard abuse. It is Ex (CE), FM and CSA approved. You break it, we replace it... forever. ©2002-2019 CopsPlus.com: Pelican 4000 King PelicanLite Spotlight FREE SHIPPING!